Watch coach Nathan Buckley address the Magpie Army at the 2014 E.W. Copeland Trophy Dinner at the Crown Palladium. Watch coach Nathan Buckley address the Magpie Army at the 2014 E.W. Copeland Trophy Dinner at the Crown Palladium. Scott Pendlebury won his third E.W. Copeland Trophy in his first season as Collingwood captain. 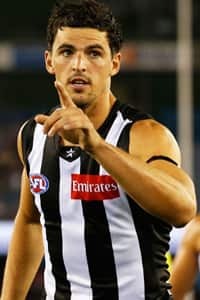 Collingwood midfielder Scott Pendlebury has capped off an outstanding first season as captain by winning his second consecutive, and third overall, E.W. Copeland Trophy at Crown’s Palladium Ballroom this evening. Pendlebury headed off challenges from fellow on-ballers Steele Sidebottom and Dayne Beams to claim the Best and Fairest award, reaffirming his status as one of the all-time greats of the Black and White. The 26-year old was also named as the Magpie Army Player of the Year, and received the Gavin Brown Award for leading desire indicators. Earning his fifth All-Australian guernsey this season, Pendlebury polled 165 votes to finish 51 clear of runner-up Sidebottom (114), who claimed the R.T. Rush Trophy, with J.J. Joyce Trophy recipient Beams (112) a further two back. Defender Heritier Lumumba (89) and Brent Macaffer (85) rounded out the top five, claiming the J.F. McHale and Jack Regan Trophy’s respectively. Having only missed 10 games in seven seasons leading into this year, Pendlebury’s assiduous approach to preparation once again paid dividends, featuring in all but one of Collingwood’s 22 matches for the 2014 campaign. A paragon of consistency, Pendlebury thrived in his newfound captaincy role, ranking inside the AFL’s top ten for effective disposals per game (3rd), disposals per game (6th), contested possessions per game (8th) and free-kicks for (9th). Meanwhile, he led all Magpies in total disposals (596), contested possessions (273), disposals per game (28.4), total tackles (116) and goal assists (14), while he was equal first with Sidebottom for uncontested possessions (314). Retiring forward Quinten Lynch was recognised for his contribution around the club with the Darren Millane Perpetual Memorial Trophy as Best Clubman and defender Tom Langdon received the Harry Collier Trophy for Best First Year Player. Midfielder Kyle Martin secured back-to-back Joseph Wren Awards as the club’s Best VFL Player, while with 39 goals for the season, Travis Cloke earned a fifth consecutive Gordon Coventry Trophy. The Phonse Kyne Award for services to the club was presented to the club’s trainer of 33 years, Colin Arnell. Retiring at the conclusion of the 2014 season, Arnell is a beloved figure of Collingwood’s football staff, and is a veteran of two Premierships, seven Grand Finals, 41 finals matches and more than 1,000 training sessions.